Salsa Lizano is a commercial bottled condiment sauce made in Costa Rica. It is a thin but slightly-viscuous, smooth, pale coffee-coloured, vegetable-based sauce. It pours like a thin gravy. It can be used as a flavouring in cooking, or as a condiment at the table. The sauce is only very slightly spicy: on a hotness scale of 10, the sauce would only rate as a .5. In fact, the taste is more salt, and herb. There is a slight sweet and sour aspect to the taste. The overall taste is not overwhelming: it enhances a dish’s flavour, rather than masking it. It is omnipresent on restaurant tables in Costa Rica. The flavour works well with Costa Rican dishes, as Costa Rican cooking is not as highly spiced as other Central American cuisines. 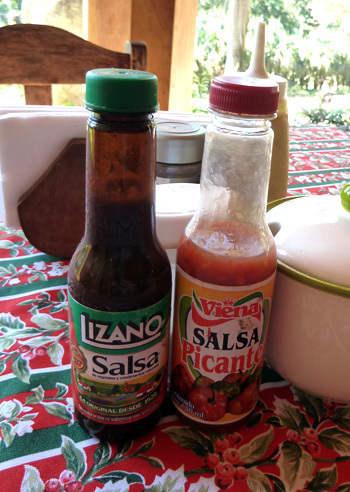 Lizano Sauce is used particularly to jazz up Costa Rican rice and bean dishes, such as the dish called “gallo pinto.” It’s also popular splashed on eggs and potatoes. Though the exact recipe is secret, ingredients include water, vinegar, sugar, salt, black pepper, cumin, mustard, turmeric, and vegetables such as carrots, cauliflower, cucumbers and onions. 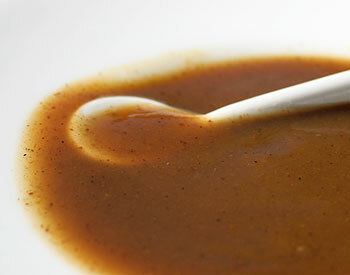 The sauce is mass-produced in a factory in San Antonio de Belén, Costa Rica. In the factory, there are people who help prepare various components of the sauce, but they don’t know the whole recipe; only the master sauce-maker does. In Costa Rica, you can buy the sauce in various sized bottles and containers, including half-gallon white plastic jugs. In North America, the sauce is available here and there in ethnic stores, but mostly, fans procure it by mail order. Worcestershire sauce, though the flavour and texture are quite different. Safe for vegetarians and vegans. The Lizano company first made and sold Lizano Sauce in 1920. The company is now (2011) owned by Knorr, which in turn is owned by Unilever. Lizano sauce was created by a man named Prospero Jiménez in Alajuela province of Costa Rica in 1920. Jiménez was a self-taught business man. He had a tavern in the center of Alajuela, at the corner of Calle Central and Avenida 4. To help business, he decided to make a pickled vegetable mix to offer to his customers as a snack (“boca” in Costa Rican Spanish), at a time when other taverns just offered a candy or a gum. His pickle mix — chopped mixed vegetables pickled in vinegar — proved popular with his customers, and Jiménez then began making it in greater quantities and selling it to local grocery stores. This was his first product, still sold today as “Encurtido Lizano.” He called his company “Prospero Lizano”, and established a factory in El Carmen de Alajuela, Costa Rica. A few years later, Lea & Perrins arrived in Costa Rica. Jiménez examined the sauce, and decided he could create a home-grown version of the sauce based on his pickling knowledge, and did, in 1920. Jiménez kept his recipe secret. In 1950, the company expanded, buying the property of a company that had suffered a fire, and restoring the buildings for use. In the early 1950s, Jiménez taught the secret recipe to Claudio Rojas Araya, from Zarcero, Costa Rica, who had started with the company in the 1940s as a messenger. Jiménez chose Araya to learn the recipe because he felt Araya would stay with the company (he did.) Araya documented the recipe and locked it away, in case anything happened to him. The actual ownership of the business passed to Jiménez’s son, Willy Jiménez. In 1991, Willy was ailing, and told Araya he wanted to sell the business. He sold it to Best Foods, through their Knorr arm. In the same year, production of the sauce moved to its present (2011) larger facilities in San Antonio de Belén, Costa Rica. Best Foods asked Araya to stay on for three months. He agreed, provided no one interfered by trying to tell him how to mix the sauce. In fact, Araya stayed on for many years after, at least until 2004. In 2000, the sauce came under the umbrella of Unilever, when it purchased Best Foods. Called “Salsa Lizano” in Spanish. Sandoval, Ana Cristina Camacho. Calienta competencia para la Salsa Lizano. Guadalupe, San José, Costa Rica: Capital Financiero. 17 September 2006. Ulloa, Rodolfo González. La mano detrás de la Salsa Lizano. Guadalupe, San José, Costa Rica: Capital Financiero. 29 August 2004.